^ Farrah, G (2016-06-16). “The use of oral antibiotics in treating acne vulgaris: a new approach.”. w:Dermatology and Therapy.. doi:10.1111/dth.12370. PMID 27306750. https://onlinelibrary.wiley.com/doi/10.1111/dth.12370/abstract. ^ a b c d e f g h i j k l m 日本皮膚科学会 2017. ^ a b c d e Zaenglein AL, Pathy AL, Schlosser BJ, Alikhan A et al. (2016-5). “Guidelines of care for the management of acne vulgaris”. en:Journal of the American Academy of Dermatology (JAAD) 74 (5): 945-973.e33. doi:10.1016/j.jaad.2015.12.037. PMID 26897386. https://www.jaad.org/article/S0190-9622(15)02614-6/fulltext. ^ a b Enshaieh S, Jooya A, Siadat AH, Iraji F (2007). “The efficacy of 5% topical tea tree oil gel in mild to moderate acne vulgaris: a randomized, double-blind placebo-controlled study”. Indian J Dermatol Venereol Leprol (1): 22–5. PMID 17314442. https://doi.org/10.4103/0378-6323.30646. ^ a b Sharquie KE, Al-Turfi IA, Al-Shimary WM (January 2006). “Treatment of acne vulgaris with 2% topical tea lotion”. Saudi Med J 27 (1): 83–5. PMID 16432600. ^ a b Sharquie KE, Noaimi AA, Al-Salih MM (December 2008). “Topical therapy of acne vulgaris using 2% tea lotion in comparison with 5% zinc sulphate solution”. Saudi Med J 29 (12): 1757–61. PMID 19082228. ^ a b Danby, FW (2013-7). “Turning acne on/off via mTORC1.”. Experimental Dermatology. 22 (7): 505-6. doi:10.1111/exd.12180. PMID 23800069. ^ a b c d Kumari, R (2013-6). “Role of insulin resistance and diet in acne.”. Indian Journal of Dermatology. 79 (3): 291-9. doi:10.4103/0378-6323.110753. PMID 23619434. ^ LaRosa, CL (2016-8). “Consumption of dairy in teenagers with and without acne.”. w:Journal of the American Academy of Dermatology. (JAAD) 75 (2): 318-22. doi:10.1016/j.jaad.2016.04.030. PMID 27241803. http://www.jaad.org/article/S0190-9622(16)30131-1/abstract. ^ Melnik, BC (2011). “Evidence for acne-promoting effects of milk and other insulinotropic dairy products.”. Nestle Nutr Workshop Ser Pediatr Program. 67: 131-45. doi:10.1159/000325580. PMID 21335995. ^ Danby, FW (2010-11). “Nutrition and acne.”. Clinics in Dermatology. 28 (6): 598-604. doi:10.1016/j.clindermatol.2010.03.017. PMID 21034984. ^ a b Ferdowsian, HR (2010-3). “Does diet really affect acne?”. Skin Therapy Letter. 15 (3): 1-2. PMID 20361171. ^ a b Adebamowo, CA (2008-05-05). 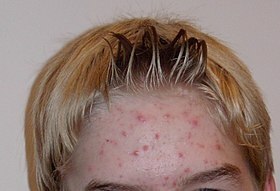 “Milk consumption and acne in teenaged boys.”. JAAD. 58 (5). doi:10.1016/j.jaad.2007.08.049. PMC: 4391699. PMID 18194824. https://www.ncbi.nlm.nih.gov/pmc/articles/PMC4391699/. ^ a b c Adebamowo, CA (2005-2). “High school dietary dairy intake and teenage acne.”. JAAD. 52 (2): 207-14. doi:10.1016/j.jaad.2004.08.007. PMID 15692464. ^ a b c d e Pontes, Tde C (2013-11). “Incidence of acne vulgaris in young adult users of protein-calorie supplements in the city of João Pessoa--PB.”. Anais Brasileiros de Dermatologia. 88 (6): 907-12. doi:10.1590/abd1806-4841.20132024. PMC: 3900340. PMID 24474098. https://www.ncbi.nlm.nih.gov/pmc/articles/PMC3900340/. ^ Rahaman, SM (2016-10). “Association of insulin-like growth factor (IGF)-1 gene polymorphisms with plasma levels of IGF-1 and acne severity.”. JAAD. 75 (4): 768-73. doi:10.1016/j.jaad.2016.05.019. PMID 27476104. ^ Grossi, E (2016). “The constellation of dietary factors in adolescent acne: a semantic connectivity map approach.”. JEAD. 30 (1): 96-100. doi:10.1111/jdv.12878. PMID 25438834. ^ Melnik, BC (2015-12-24). “Is sebocyte-derived leptin the missing link between hyperseborrhea, ductal hypoxia, inflammation, and comedogenesis in acne vulgaris?”. 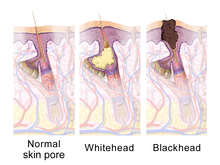 Experimental Dermatology. ePub. doi:10.1111/exd.12917. PMID 26660941. http://onlinelibrary.wiley.com/doi/10.1111/exd.12917/full. ^ “Diet in dermatology: Part I. Atopic dermatitis, acne, and nonmelanoma skin cancer.”. JAAD. 71 (6): 1039.e1-1039.e12. (2014-12). doi:10.1016/j.jaad.2014.06.015. PMID 25454036. ^ a b Burris, J (2014). “Relationships of self-reported dietary factors and perceived acne severity in a cohort of New York young adults.”. Journal of the Academy of Nutrition and Dietetics. 114 (3): 384-92. doi:10.1016/j.jand.2013.11.010. PMID 24412232. ^ a b c d Wolkenstein, P (2014-11). “Smoking and dietary factors associated with moderate-to-severe acne in French adolescents and young adults: results of a survey using a representative sample.”. Dermatology. 230 (1): 34-9. doi:10.1159/000366195. PMID 25413494. ^ Melnik, BC (2013-11). “Acne: risk indicator for increased body mass index and insulin resistance.”. Acta Dermato-Venereologica. 93 (6): 644-9. doi:10.2340/00015555-1677. PMID 23975508. ^ a b c d e f g Di, Landro A (2012-12). “Family history, body mass index, selected dietary factors, menstrual history, and risk of moderate to severe acne in adolescents and young adults.”. JAAD. 67 (6): 1129-35. doi:10.1016/j.jaad.2012.02.018. PMID 22386050. ^ a b 日本皮膚科学会 2017, pp. 1292-1293. ^ Chularojanamontri L, Tuchinda P, Kulthanan K, Pongparit K (May 2014). “Moisturizers for Acne: What are their Constituents?”. J Clin Aesthet Dermatol (5): 36–44. PMC: 4025519. PMID 24847408. https://www.ncbi.nlm.nih.gov/pmc/articles/PMC4025519/. ^ Arielle R. Nagler (2016-2). “The use of oral antibiotics before isotretinoin therapy in patients with acne.”. JAAD 74 (2): 273-9. doi:10.1016/j.jaad.2015.09.046. PMID 26525749. http://www.jaad.org/article/S0190-9622(15)02254-9/abstract. ^ Barbieri, JS (2016-08-05). “Duration of oral tetracycline-class antibiotic therapy and use of topical retinoids for the treatment of acne among general practitioners (GP): A retrospective cohort study.”. JAAD (16): 30472-8. doi:10.1016/j.jaad.2016.06.057. PMID 27502311. http://www.jaad.org/article/S0190-9622(16)30472-8/abstract. ^ Sahib, Ahmed Salih (2013). “Effects of Oral Antioxidants on Lesion Counts Associated with Oxidative Stress and Inflammation in Patients with Papulopustular Acne”. Journal of Clinical & Experimental Dermatology Research 03 (05). doi:10.4172/2155-9554.1000163. ^ Elsaie ML, Abdelhamid MF, Elsaaiee LT, Emam HM (April 2009). “The efficacy of topical 2% green tea lotion in mild-to-moderate acne vulgaris”. J Drugs Dermatol 8 (4): 358–64. PMID 19363854. ^ a b c d e f g h Nast A, Dréno B, Bettoli V, et al. ; European Dermatology Forum (2012-2). “European evidence-based (S3) guidelines for the treatment of acne”. en:Journal of the European Academy of Dermatology and Venereology. (JEADV) 26 (1): 1-29. doi:10.1111/j.1468-3083.2011.04374.x. PMID 22356611. https://onlinelibrary.wiley.com/doi/10.1111/j.1468-3083.2011.04374.x/full. ^ Garner, SE (2003-01-20). “Minocycline for acne vulgaris: efficacy and safety.”. The Cochrane database of systematic reviews. (1): CD002086. doi:10.1002/14651858.cd002086. PMID 12535427. https://doi.org/10.1002/14651858.CD002086. ^ Garner, SE (2012-08-15). “Minocycline for acne vulgaris: efficacy and safety.”. en:The Cochrane database of systematic reviews. (8): CD002086. doi:10.1002/14651858.cd002086.pub2. PMID 22895927. https://doi.org/10.1002/14651858.CD002086.pub2. ^ Le Cleach L, Lebrun-Vignes B, Bachelot A, et al. (October 2017). “Guidelines for the management of acne: recommendations from a French multidisciplinary group”. Br. 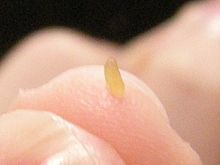 J. Dermatol. (4): 908–913. doi:10.1111/bjd.15843. PMID 29052890. ^ a b c d e Darren, D Lynn (2016-01-19). “The epidemiology of acne vulgaris in late adolescence”. Adolescent Health, Medicine and Therapeutics. 7: 13-25. doi:10.2147/ahmt.s55832. PMC: 4769025. https://www.dovepress.com/the-epidemiology-of-acne-vulgaris-in-late-adolescence-peer-reviewed-article-ahmt. ^ 川島眞、赤松浩彦、林伸和、ほか (2008-11). 皮膚科専門医療機関における痤瘡患者実態調査. ガルデルマ株式会社、塩野義製薬株式会社. http://www.differin.jp/doctor/pdf/research.pdf 2016年9月24日閲覧。. ^ a b c d Okoro, EO (2016-01-08). “Association of diet with acne vulgaris among adolescents in Ibadan, southwest Nigeria.”. International Journal of Dermatology. 114 (3): 384-392. doi:10.1111/ijd.13166. PMID 26749364. https://onlinelibrary.wiley.com/doi/10.1111/ijd.13166/abstract. ^ Czilli, T (2016-06-08). “Cost of Medications Recommended by Canadian Acne Clinical Practice Guidelines.”. w:Journal of Cutaneous Medicine and Surgery.. doi:10.1177/1203475416653735. PMID 27281440. ^ Kuhn, KG (2016-11). “High consumption of tetracyclines for acne treatment among young Danish adults.”. w:The Journal of Infectious Diseases. 48 (11-2): 808-12. doi:10.1080/23744235.2016.1205214. PMID 27385460.